As I said on my Instagram about a week ago, I’m a sucker for a good celebrity endorsement. I’ve never looked at a Shu product and thought I had to have it right at launch. Add Pony to the mix, though, and I jumped right on that bandwagon. Two of the Rouge Unlimited Supreme Matte lipsticks came right to my doorstep. Apologies to my wallet. Shu’s website lists the Rouge Unlimited Supreme Matte lipstick as “the perfect combination of extreme matte and ultimate comfort with moisturizing ingredients to deliver the smoothest matte finish with all-day comfort”. Pony herself did a little video talking about her favorite shades, which you can find right here. Pony listed shades RD144, OR550, PK354, and CR344 as main colors. PK375 was Pony’s personal pick for her favorite. Pony’s video says that there are 24 shades in the line, but the Shu website only has 15 available. The rest, I believe, are Asia exclusives, which means you’ll have to import them. When I purchased my lipsticks, there were two offers available. The first was free shipping over $50. The second was a coupon code where you got 7 free sample products when you spent over a certain amount. Unfortunately that coupon has expired, but you better believe I took advantage of it. I purchased two colors: RD144 and OR550. They come in typical Shu Uemura style bullets. The lipsticks themselves are round, and so in terms of application if you are the kind of person who precisely outlines your cupid’s bow you may have some issues there. 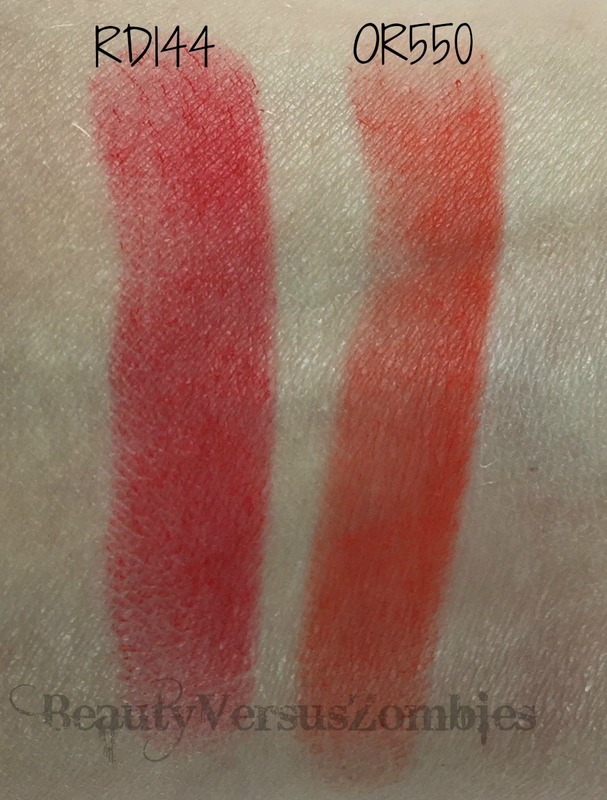 Here are some swatches of the two colors that I purchased. As you can see, the Rouge Unlimited Supreme Matte lipsticks are decently pigmented, but not as strong as I would expect a non-matte lipstick to be. You may have to apply twice in some areas to get perfect coverage. I did in smaller areas, like the corner of my mouth. For color comparison purposes, here are some swatches against other products that I own. As you can see the Supreme Matte RD144 is basically a matte version of the earlier limited edition Mon Shu Red. 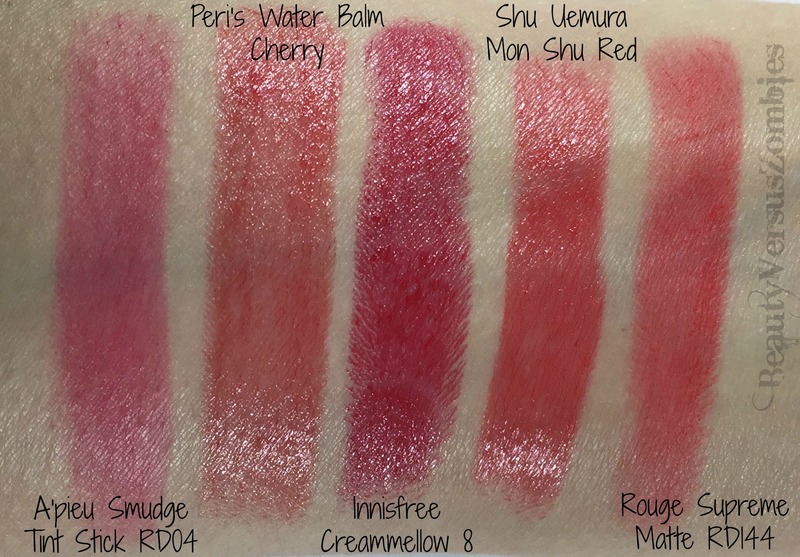 It’s lighter and less pink than the Innisfree Creammellow, brighter than the Peripera Water Balm in Cherry, and significnatly less pink than the A’pieu Smudge Tint Stick in RD04. I’d call it an almost-neutral pink red, personally. The closest thing to OR550 is the A’pieu Smudge Tint Stick in OR02. 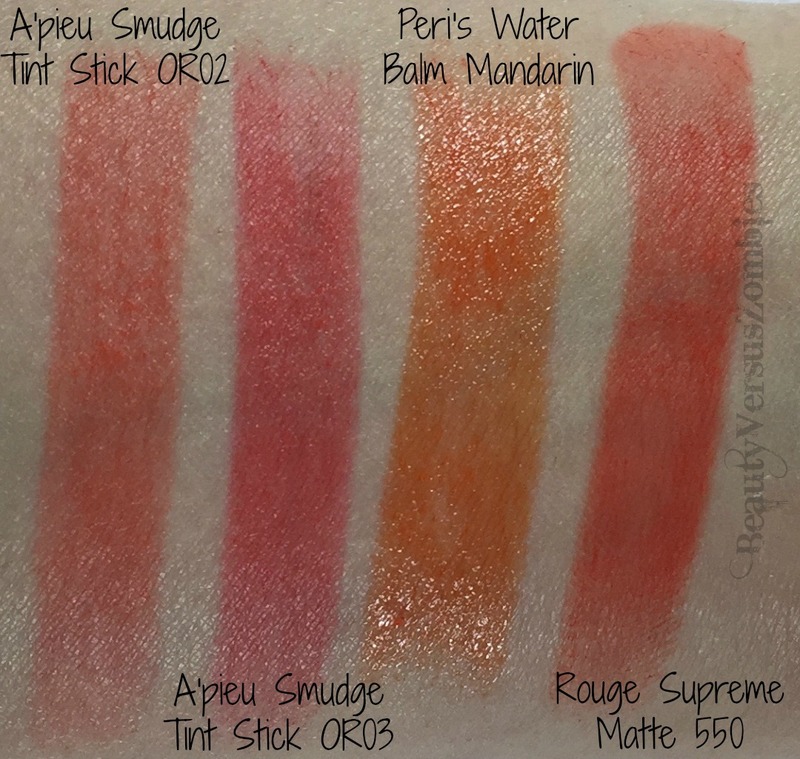 It’s not a dead-bang match, but considering the price difference (the A’pieu is around $10 if you purchase from Korea) it’s a perfectly adequate substitute for the Rouge Unlimited Supreme Matte. And it’s also pretty matte. The OR03 is way too pink, and Peri’s Water Balm in Mandarin is far too yellow to be a match. The lipsticks go on smoothly and don’t drag at all. They feel very silky when applied. After two hours, I could tell that there was more color in the lines on my lips. However, from further away the lipstick still looked completely natural, with full coverage. I could re-blend it a little by pressing my lips together. Despite the claims, I did not find this lipstick to be particularly moisturizing – I actually thought it was a little drying. At about three hours in, it started to feel less creamy and more powdery, and it started losing pigmentation. The color made it through a couch to 5k session but by the end, which would be about the 4.5 hour point, it was noticeably faded and not really comfortable to wear anymore. I wiped it off at that point, and if I wanted to have consistent lipstick throughout the day I would have had to reapply. In order to get the best look with this product, your lips should be hydrated and exfoliated. It will accumulate in lip lines and will catch on dry skin. You can purchase the Rouge Unlimited Supreme Matte lipstick in the 15 shades available in the U.S. on Shu Uemura’s website. They cost $30 apiece, which is (in my opinion) pretty expensive for a lipstick. You can find 3 colors, including Pony’s favorite, on Sephora Canada for $36 Canadian. 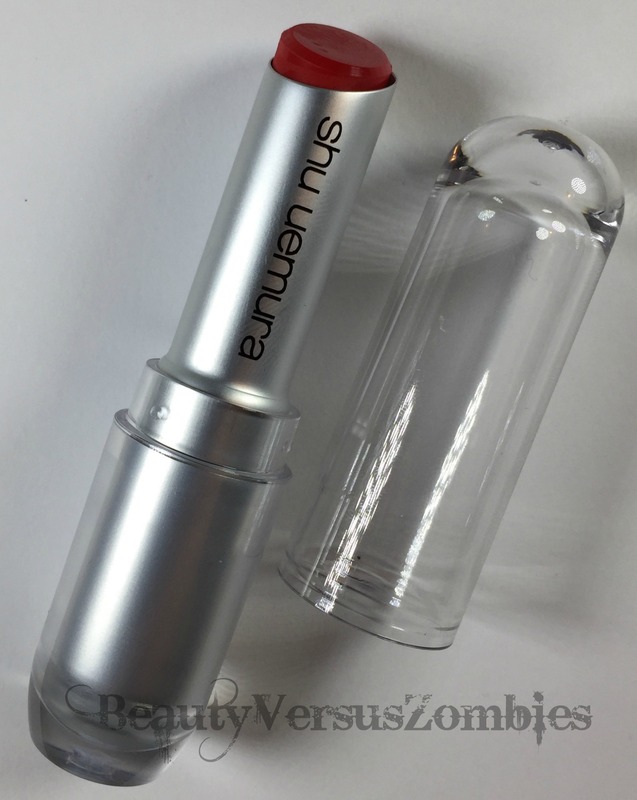 This entry was posted in makeup, review, shu uemura and tagged makeup, review by BeautyVersusZombies. Bookmark the permalink.